It is a widespread public myth that brakes are no longer made with asbestos. Many auto mechanics and public safety officials even believe this. However, analysis has shown that a significant portion of the dust samples collected at brake repair shops is asbestos. This material may directly cause mechanics to develop mesothelioma or lung cancer decades after they stop working with brakes. The US Environmental Protection Agency took action to phase out asbestos-containing products in brakes in July 1989. In October 1991 a federal court rescinded the ban. A November 2000 article in the Seattle Post-Intelligencer stated that "millions of brakes on cars and trucks - and millions more waiting on parts-shop shelves nationwide - contain asbestos fibers that can kill mechanics." Even today, with the well-known problems that asbestos poses, most auto-repair shops are not equipped to handle asbestos in a safe manner. Industrial hygienists have developed techniques for reducing exposure risk, but many small shops do not follow them. Pressed for time and encouraged to turn over as many cars a day as possible, mechanics often ignore safety procedures. For instance, compressed air used to blow away dust from the brakes can be very detrimental and cause dust particles to invade the air that workers breathe. 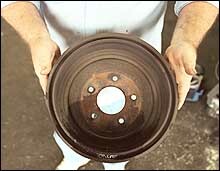 Hitting a brake drum or wiping it with a dry brush can cause millions of dust particles to become airborne. The best approach is to use wetness. In a wet environment particles are more likely to stick together and dust doesn't form. Water makes a mess, and many mechanics and shop foremen prefer a dry floor. But water can be an invaluable tool in stopping the spread of mesothelioma and asbestosis. Some auto shops purchase respirators for their mechanics and keep vacuums available for work on brakes. Time-pressed mechanics often forgo use of the vacuum because it is too much trouble to set up.